First a note about these ingredients. The original recipe calls for double what you see here. I realized upon filling my pot with milk that two gallons weren’t going to fit and cut the recipe in half. 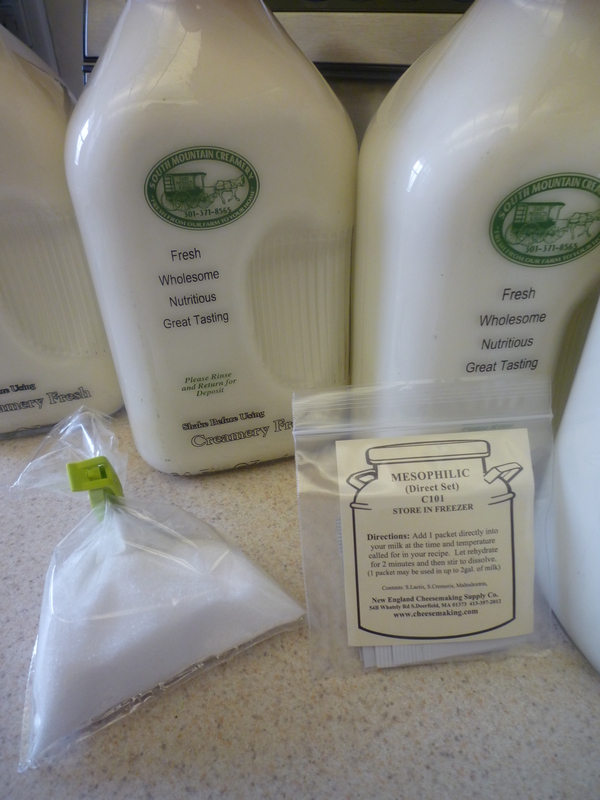 Pour the milk into a large pot and place it in a sink of warm water. 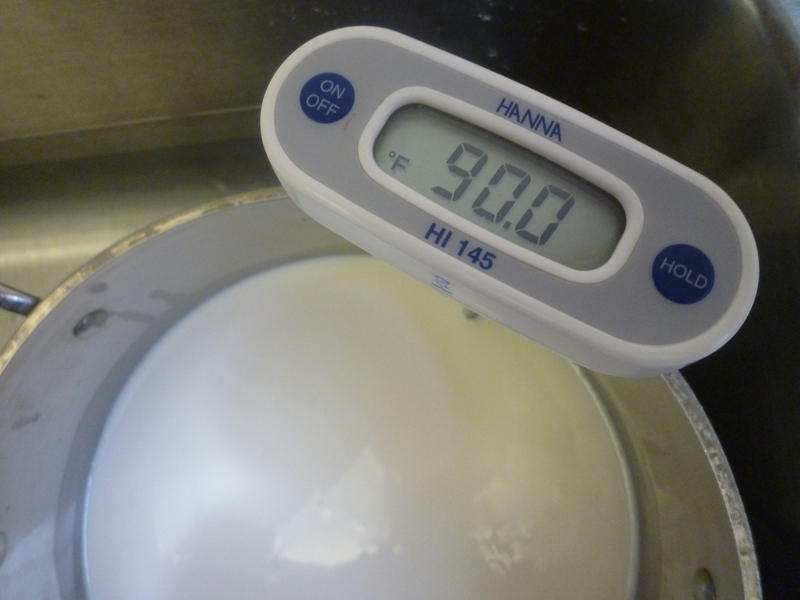 Gradually increase the temperature of the water bath, either by running more hot water from the tap or adding small amounts of boiling water, until the milk reaches 90 degrees F. Add the mesophilic starter and mix well for about a minute. 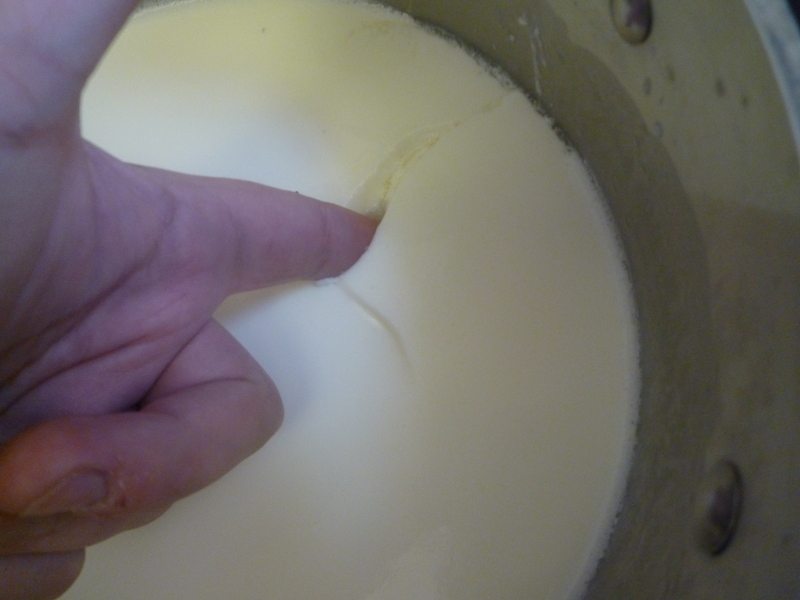 Cover the pot and allow the milk to ripen for 45 minutes. Check the temperature every so often, you want to keep it as close to 90 degrees as possible. I left my pot in the warm water bath and added small amounts of hot water every 10 minutes or so to do this. 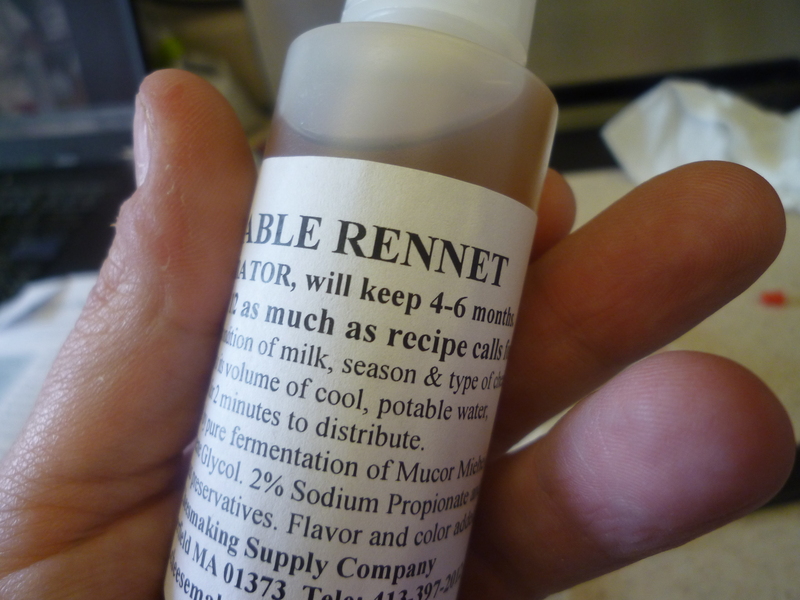 After 45 minutes, add the diluted rennet and stir, using a gentle up-and-down motion, for about a minute. 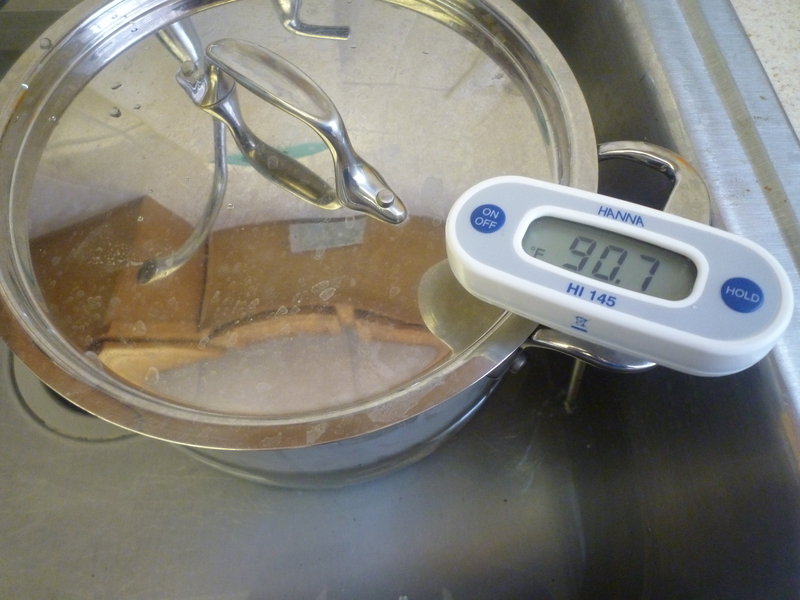 Cover the pot and let it sit at 90 degrees F for 45 minutes or until the curd breaks cleanly. 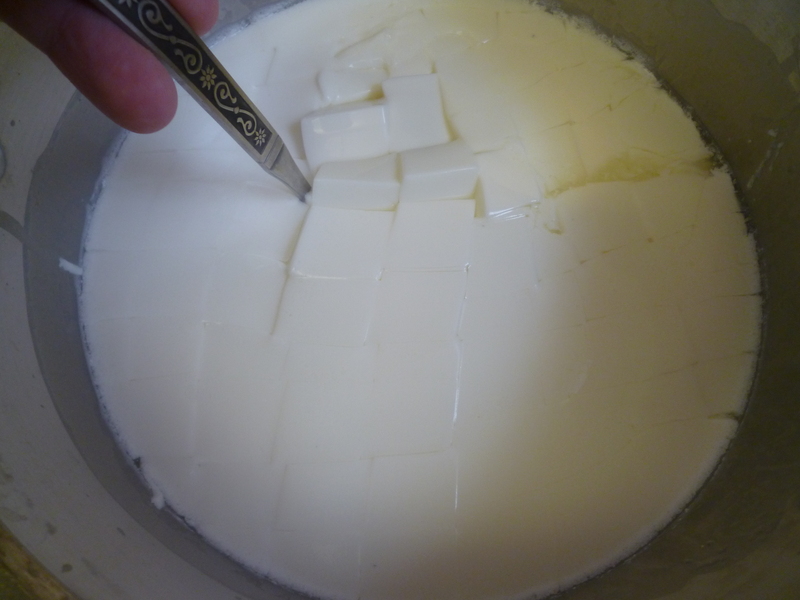 Cut the curd into a checkerboard pattern of ½ in. squares. 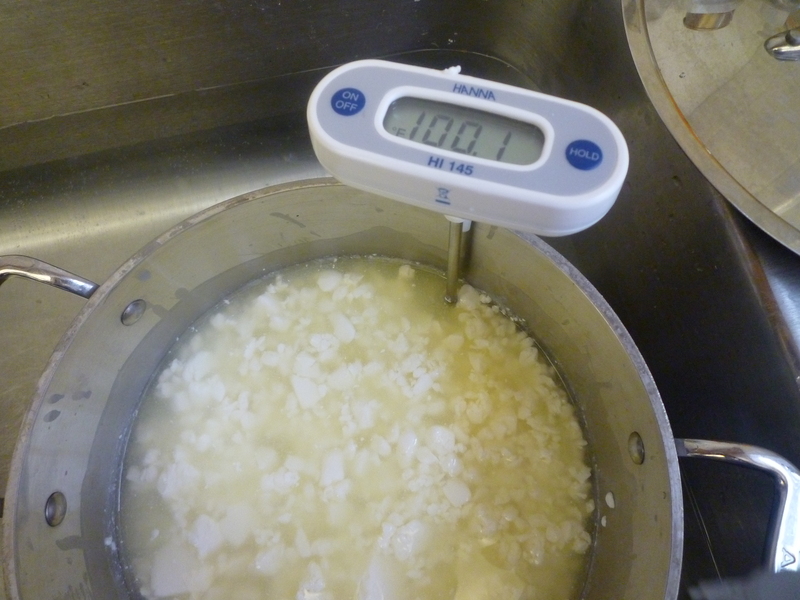 Again using the water bath method, slowly increase the temperature of the curd to 100 degrees. 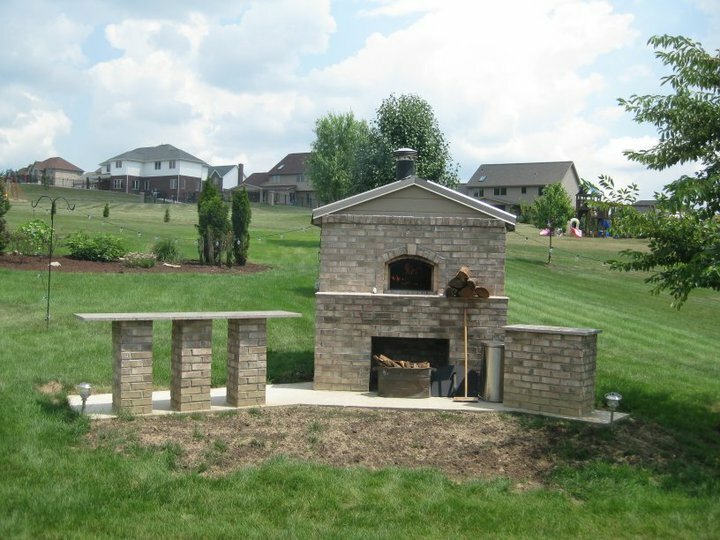 This can be a little tricky at first, since you don’t want to increase the temperature by more than 2 degrees every five minutes. Err on the slow side. 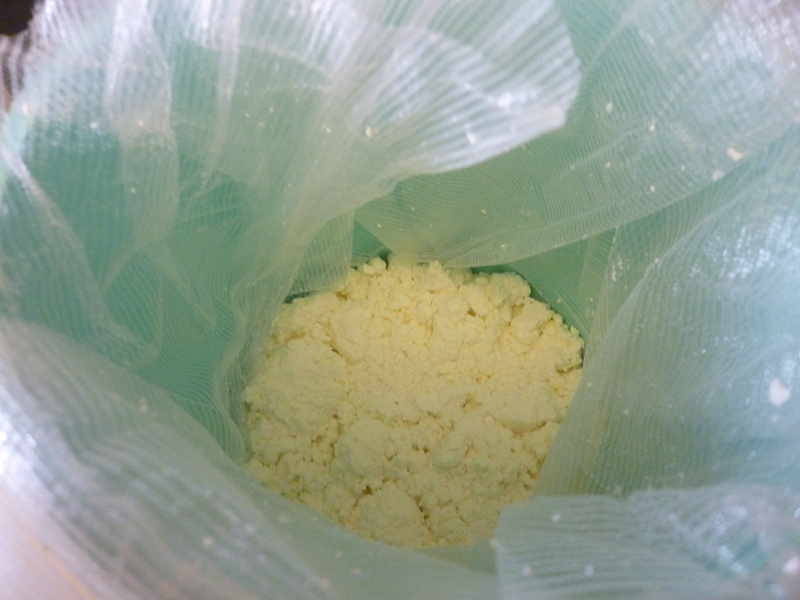 Stir gently to keep the curds from matting together as they heat up. You’ll notice that they shrink a lot. 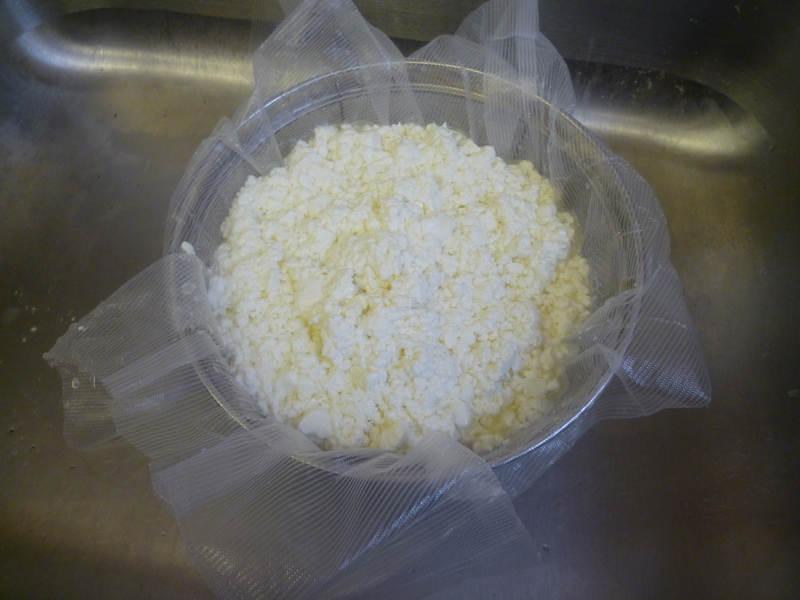 Once the curds reach 100 degrees, pour them into a colander lined with cheesecloth. 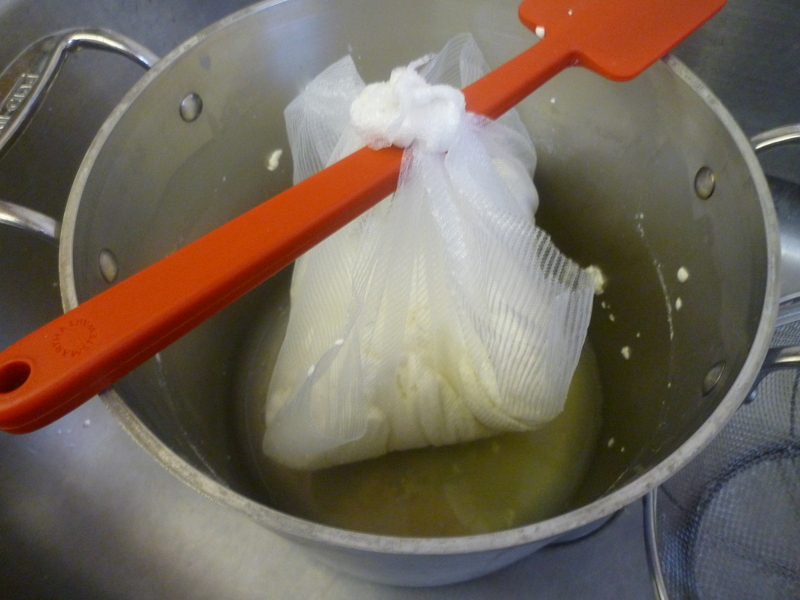 Tie up the corners of the cheesecloth and hang the curds to drain in a non-drafty spot for an hour. You want to keep them fairly warm, so I hung them over the pot I used for heating. After an hour, move the drained curd to a bowl and gently break into walnut sized pieces. 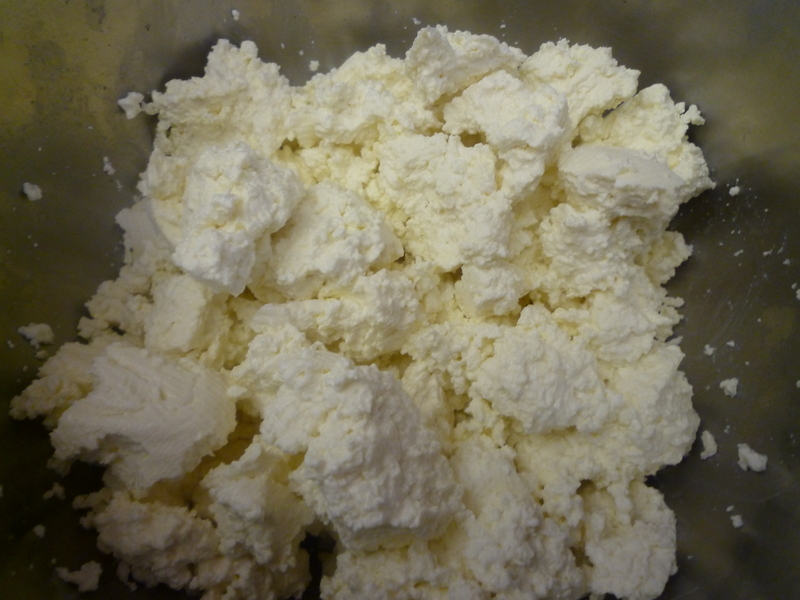 Add the salt to the curds and toss lightly with your fingers to distribute evenly. 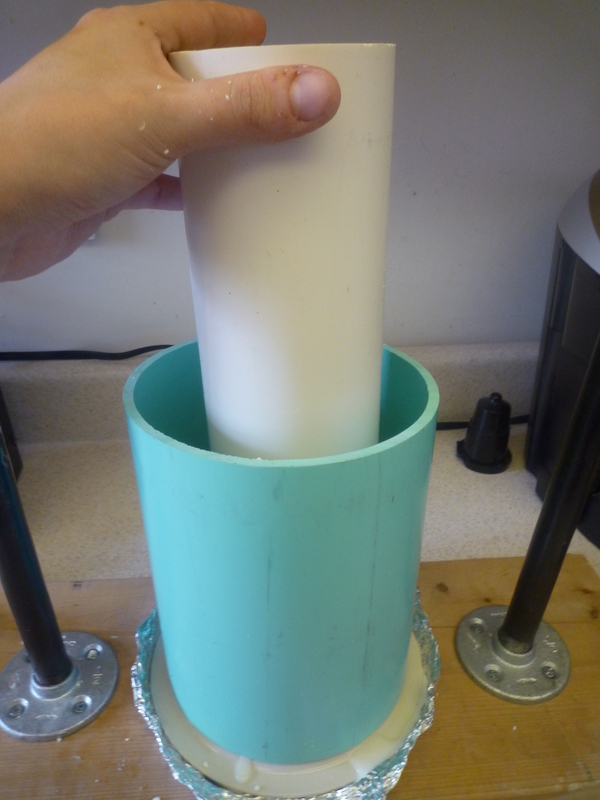 Firmly pack the curds into a mold (the teal pvc pipe pictured) lined with cheesecloth. 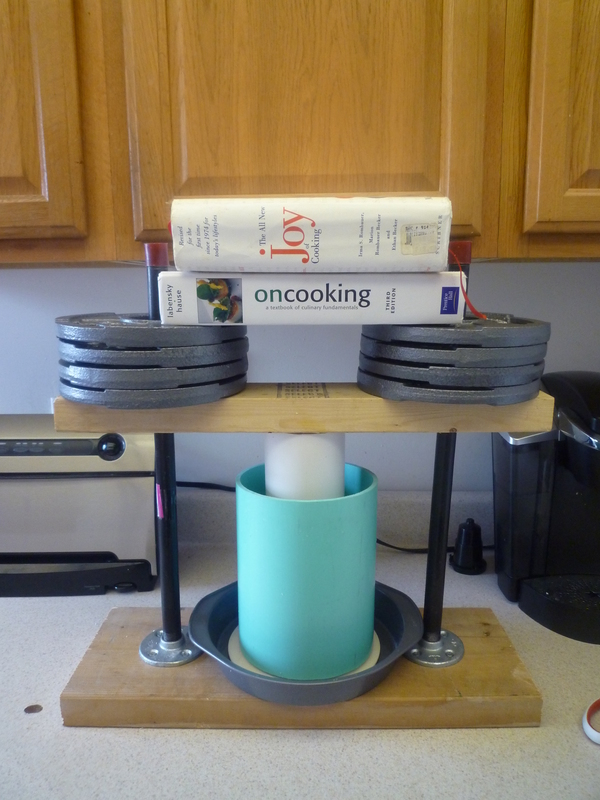 Put the mold on top of an inverted plate over a pie pan. 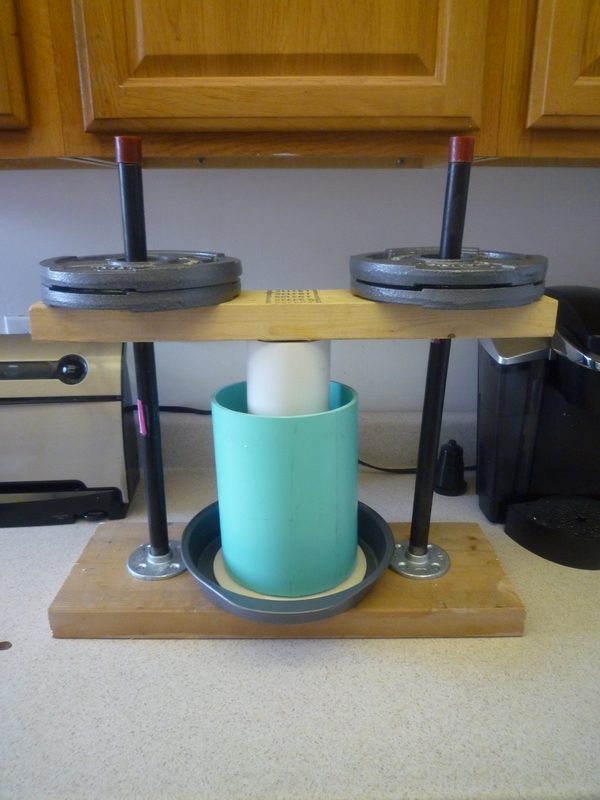 This allows the excess liquid to drain away from the cheese. 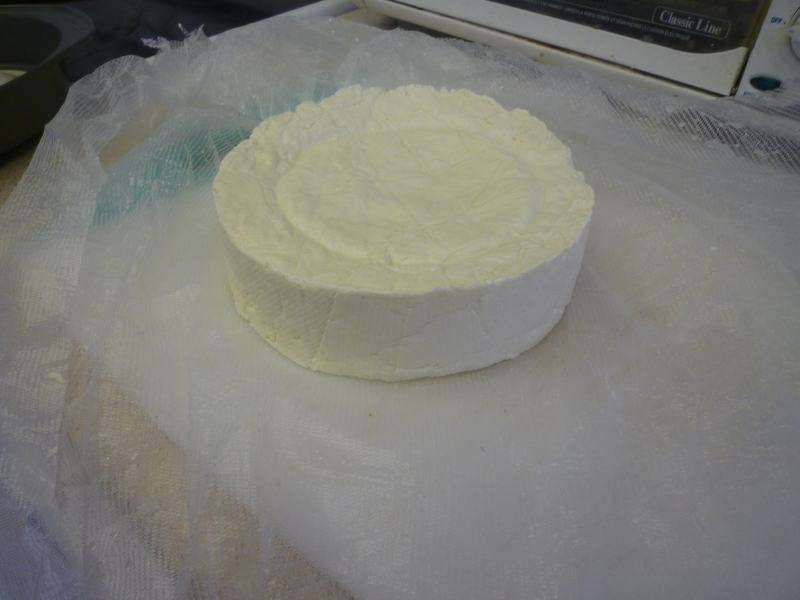 Fold the cheesecloth over the curds and place a snug fitting follower on top of them. Then add the pusher (the thinner, white piece of pvc pipe). 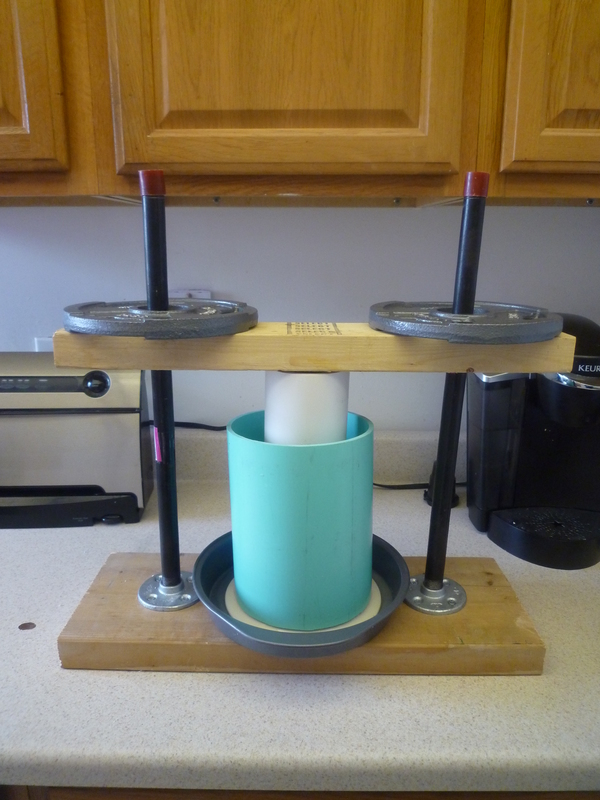 Finally, place the board on top of the pusher and add weights as necessary. And finally at 50lbs. of pressure (Fact: The Joy of Cooking and On Cooking weigh 10lbs.) for 12 hours. Don’t do what I did and neglect to think about how this would time out; I had to get up at 3 a.m. to take the 50lb. weights off. D’oh. 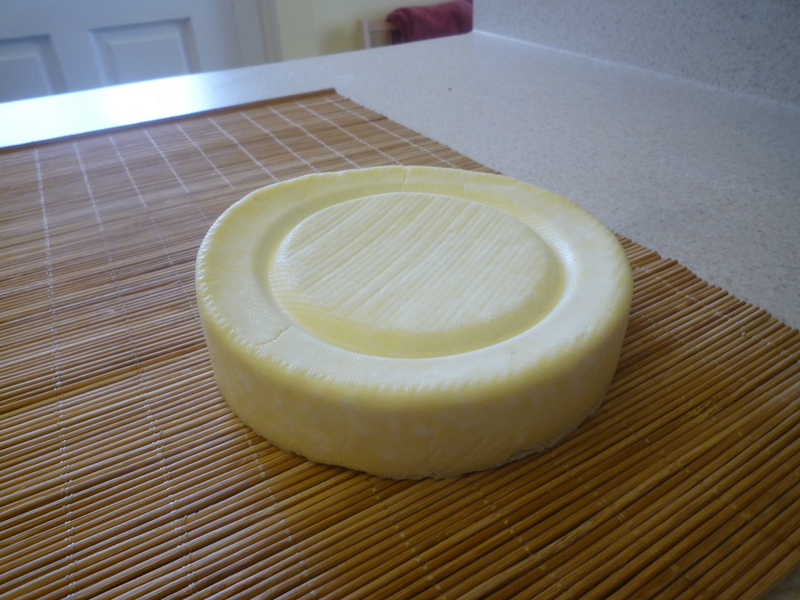 Put your cheese on a wooden board and allow it to air-dry at room temperature for 2-4 days. Turn it every so often to keep moisture from collecting on one side. 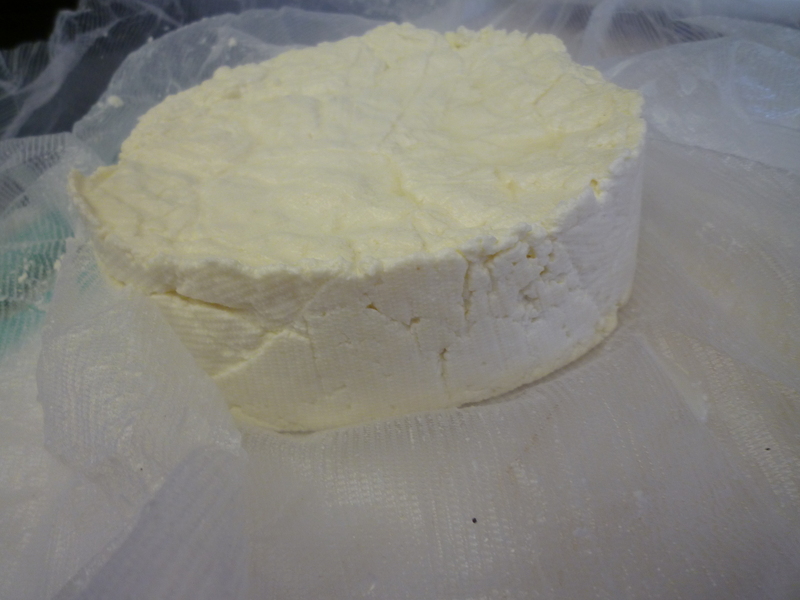 Once the cheese has dulled in appearance and is no longer moist to the touch, you are ready to wax it. 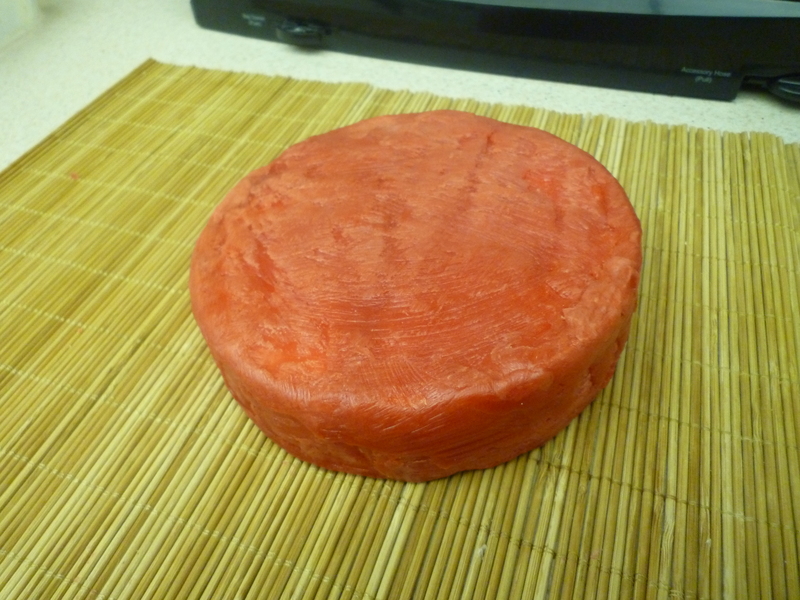 Prior to waxing, refrigerate the cheese for several hours. You may also wipe it down with a paper towel dampened with vinegar to discourage mold growth. 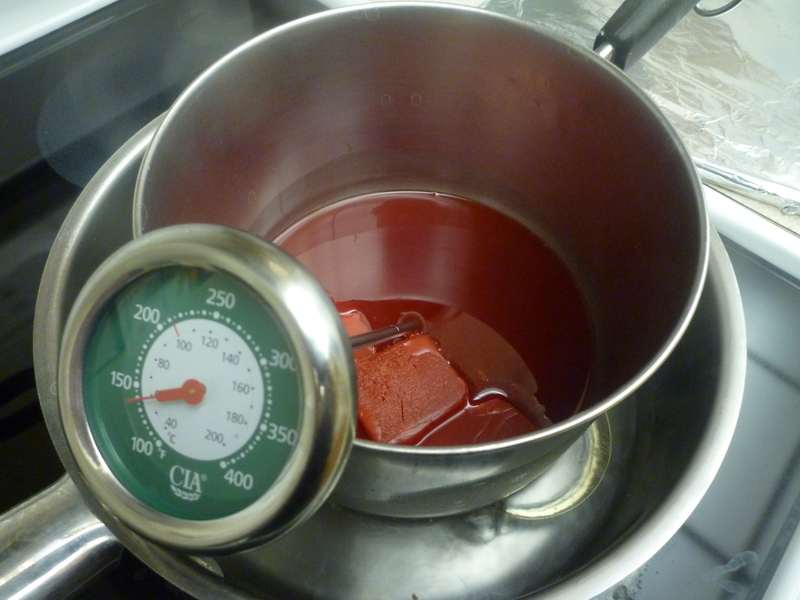 Melt the cheese wax in a double-boiler until it reaches 210 degrees. 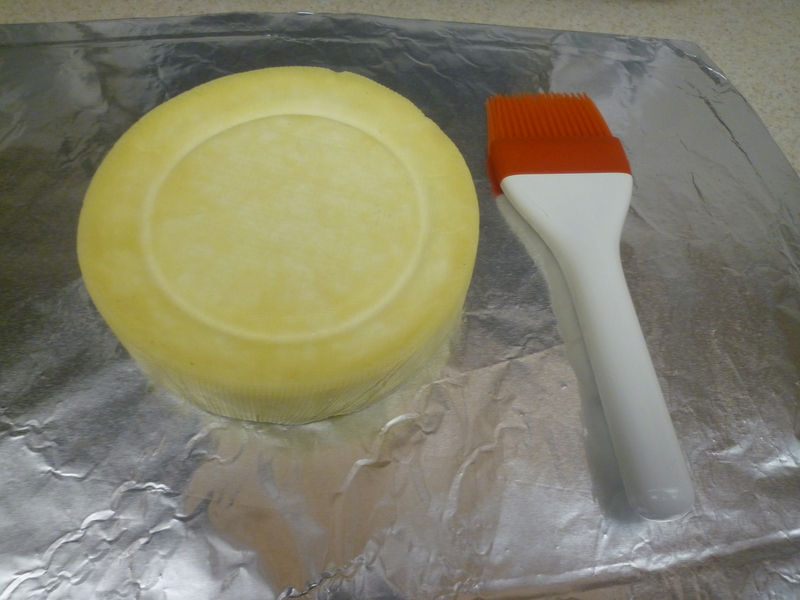 Gently paint it on the cheese using a natural bristle or silicone brush, one side at a time. 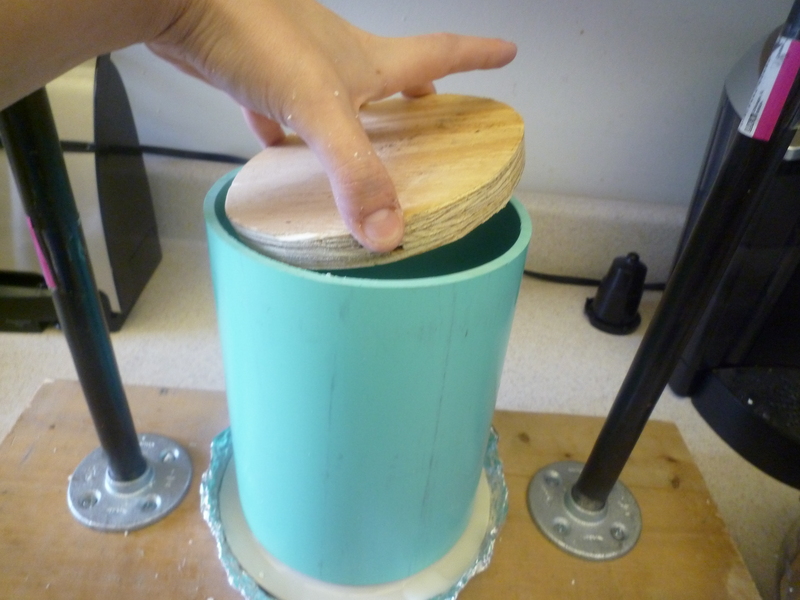 Cover the wheel in two thin coats. My wax job was a little bit messy for a first rodeo, but I’m not really in a beauty contest here. You can always remove the wax and redo it (particularly useful if you decide to age it longer after cutting into it the first time), but we’ll see how things look in a month. Age in a cool (below 68 degrees) environment for at least one month. Since the aging process began yesterday, I’ll be reporting back on 4-1-11 to let you know how it tastes. Hopefully it will not be a cruel April Fool’s joke.